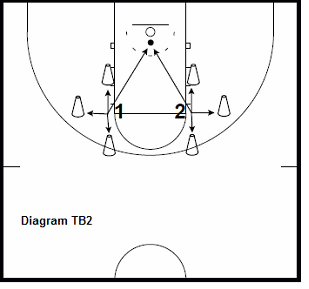 This page presents several basketball performance training drills submitted by Layton Westmoreland, Head Performance Coach/Assistant Skills Trainer at Tim Springer's Spartan Basketball. Layton Westmoreland is a basketball skill development trainer and strength and conditioning coach who helps athletes reach their athletic goals. While pursuing his athletic career in college, Layton later went on to become a certified skill development trainer through Ganon Baker Basketball and interned as a Strength and Conditioning Coach for William Penn University in Oskaloosa, Iowa. Layton has received his degree in Physical Education with an emphasis in Strength and Conditioning. and is certified through USA Weightlifting as a Sports Performance Coach. Before joining Spartan Basketball, Layton ran a successful training program, Crunch Time Athletics, in Abilene, Texas. See diagram TB1. 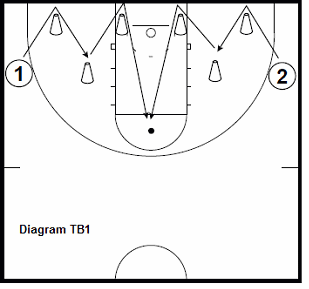 This drill can be done via defensive slides or in a sprinting fashion. Players start outside the 3pt line, and on coaches whistle they perform movement (sprint or d-slide) thru the cones and try to reach the tennis ball before their competitor. See diagram TB2. Players start facing each other in the middle of their set of cones. 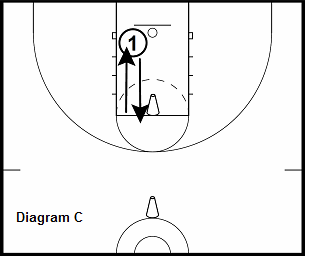 On coaches whistle, players will cut to cone on the 3 point line, then cut to cone closest to basket, then they will perform a "drop-step" to touch the last cone behind them, and then sprint to be the first to the tennis ball. Diagram A. 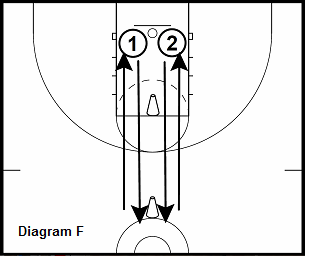 Start below the basket and sprint to the top of the key. Plant foot and shuffle to the cone on the right wing. Plant foot and shuffle back to the top of the key and over the the left wing. 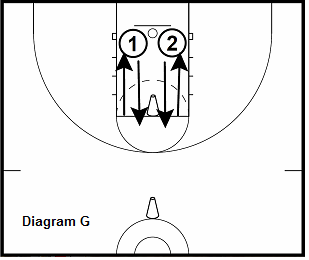 Plant foot and shuffle back to the top of the key, turn and sprint through to start below the basket. Diagram B. 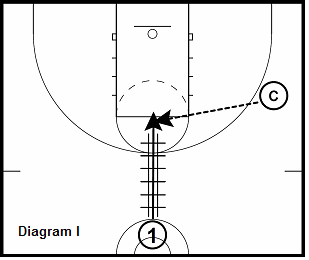 Player starts inside the lane and equal to the block in an athletic position. On the whistle, players jumps in the air simulating catching a rebound (diagram C). 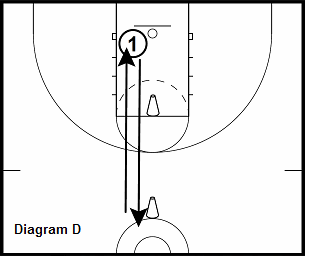 As soon as players feet hits the floor, player turns his hips and sprints to the first cone and then back-pedals back to where he started under the basket. Once the player reaches the starting position, he immediately goes up for another rebound. This time he will turn and sprint to the 2nd cone (diagram D) and then back-pedal to the start. This concludes one repetition. Player goes for five total repetitions. 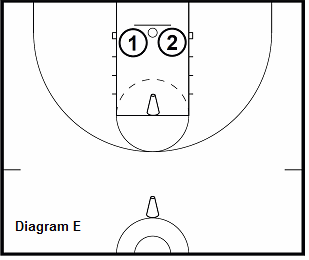 Diagram E. Both players start in the lane and equal to the block in an athletic position. Player 1 is the rabbit. Player 2 is the chaser. 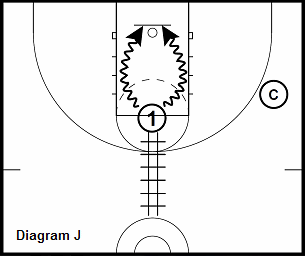 On the whistle (diagram F), both players jump for a rebound and turn to sprint as they hit the floor. Player 1 can go to the first OR second cone first. Player two must "CHASE" player number two by copying his decision. 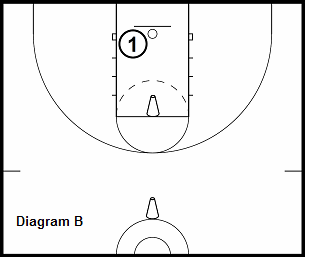 There is only one cone left, so players back-pedal back to the rim to go up for a rebound (diagram G) and they race to the last set of cones and back to finish through the starting position. Losing player has 10 push ups. 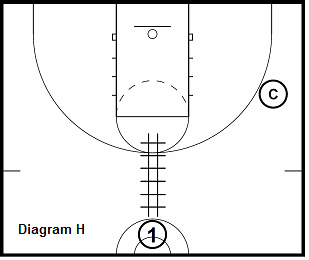 Diagram H. Player is performing 6 moves through the speed ladder to emphasize foot work. Player will perform each move 2 times before working on the next move. Player gets through the speed ladder (diagram I), gets their feet set using machine-gun feet to receive pass from coach/passer. 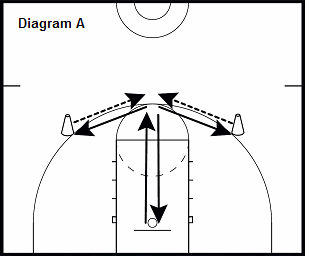 Once you receive the pass (diagram J), rip the ball low and go to the rim. Alternate sides on each repetition.